MOST Precision Motion’s patent-pending Orbital Ball Screw technology solves for challenging, precision applications across a wide variety of industries including aerospace and defense, automotive, medical, robotics, semiconductor manufacturing, machining and automation. Our proprietary design and state-of-the-art manufacturing enables us to deliver Precision Motion Ball Screws with lower rolling friction and pitch, absolute zero backlash, the highest resolution and longer product life. 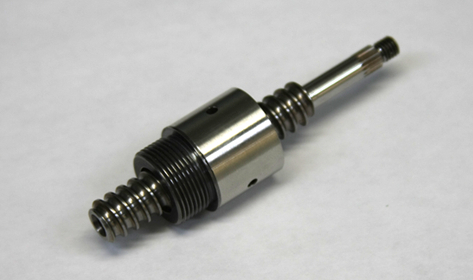 MOST Precision Motion designs and manufactures both standard, and custom ball screws. Our standard ball screw models can be modified to fit many customer applications and can often be shipped within 24 hours. When a custom ball screw is needed, our engineers bring over 60 years of combined experience to work with customers to design a precision motion ball screw based on their unique requirements. Our in-house design and manufacturing allows us to produce customized configurations for ball screws with short lead times and at high volumes while outperforming the competition in performance, delivery and price. In rigorous testing, MOST Precision Motion Ball Screws have handled over three times the weight capacity of competitive products; moving extreme dynamic loads at high speeds with outstanding accuracy and the lowest axial backlash in the industry. Based in Salem, Massachusetts, MOST Precision Motion has revolutionized the design and manufacture of precision motion ball screw products. Because we design and manufacture our ball screws in-house we maintain complete control of the process and finished product while offering extremely competitive price points and shorter lead times than our competitors. We stand behind our products with world-class customer service and take pride in manufacturing our products in the USA.